“Maid stole money 7 days back, confessed later (CCTV footage available & given to police). Then she left the house she was working and vanished (CCTV footage available & given to police). She was neither confined by anyone, nor beaten, nor did she fall sick (all this has been proven by CCTV footage). She was hiding in complex itself in another tower and was detected by guard. 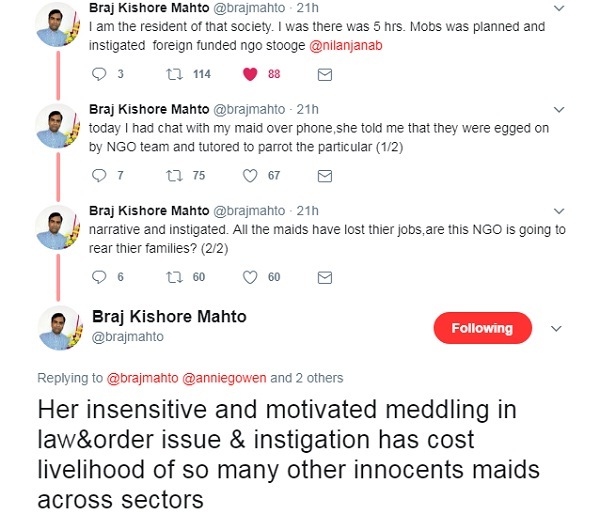 However, it doesn’t make too much of difference in this case whether the maid belongs to Bangladesh or West Bengal. The fact remains that a Muslim mob ransacked this society when one of them was found to be stealing. It seems that most residents are saying the same thing, those who were present on the scene for those few horrifying hours. The following tweets prove that the above version seems correct and that law was taken into own hands by a raging Muslim mob. (We thank Braj Kishore Mahto for speaking to us).